Hi everyone. I'm joining the challenge over at Scrappimo's blog - August Rudolph Days. The challenge runs from the 25th until the end of the month. The theme is always Anything Goes Christmas. I'm here today with another Alcohol Ink background that I made a while ago. I have a large stash of backgrounds which helps to make a quick card. This was done with smooshing three colours of alcohol inks onto Yupo paper. Once dry, I sprayed with blending solution to get the cool texture of a frosty night sky. I added a simple white die-cut from AliExpress --- another bargain of only $2.59US. And I stamped the sentiment in Delicata Silver. I love this ink because it is metallic and sparkly so there's no need to heat emboss. A fabulous card Loll - a great scene and super background too. what a very super gorgeous card. I love your wonderful design, and that background you have created is awesome. Beautiful card, Loll. I love your alcohol backgrounds and the scene you created with this one. So serene. Enjoy your day! Love the background Loll. I am trying to get ahead with my Christmas cards too as I may be a tad busy in the run up. HLS retreat and a heavily pregnant daughter! Your alcohol ink background is perfect for a snowy sky, Loll. Love your die cut winter scene. So pretty and serene. TFS my friend. Hugs..
Love, love, love this die, Loll! But the background makes the card! Gorgeous! What a BEAUTIFUL die, LURVE the background, so gorgeous. Another stunning card. The background is perfection. I am impatiently waiting for my yupo paper to come so I can start playing with alcohol inks. And what a beautiful die! such a pretty wintery scene and i love the blues for the background! I have a stash of yupo that I was not happy watercoloring on so I'll have to try the AI. thank you so much for sharing with us at the Rudolph days challenge! Your alcohol backgrounds are magnificent, Loll! Love the blend of various blues. That die cut is fabulous. After seeing all your incredible creations with Aliexpress dies, I too placed a tiny order. I only hope to be as creative with them! Love this card, Loll! That bg is fabulous and I love your little scene! I have the delicata gold, but now I can see that I need the silver too! So lovely! That die is perfect against your beautiful AI piece! This is a stunning winter scene! The gorgeous AI background makes the white die cuts really pop! Love it! This is a stunning card, Lol. You make the most wonderful backgrounds. I like your idea of having a stash on hand. The Ai Express die is so lovely. I have not bought from them but sure like the sound of dies for under 3 bucks! Love the white cuts against your [as usual] fabulous inked sky! Another beauty, Loll. I love the scene with those die cuts. I really love that hue of blue and should just buy that one AI colour. Then again, I will need some coordinating colours, and the next thing I know, I have too many AIs and no storage space...hmm, on second thought. 😂😂😂 And we'll done on being over halfway to your goal! What a gorgeous winter scene, and I love the AI background too. Isn't YUPO so much fun. A fabulous card, The white die cut scene looks great against your beautiful inky background. Oh Loll, this is fabulous! 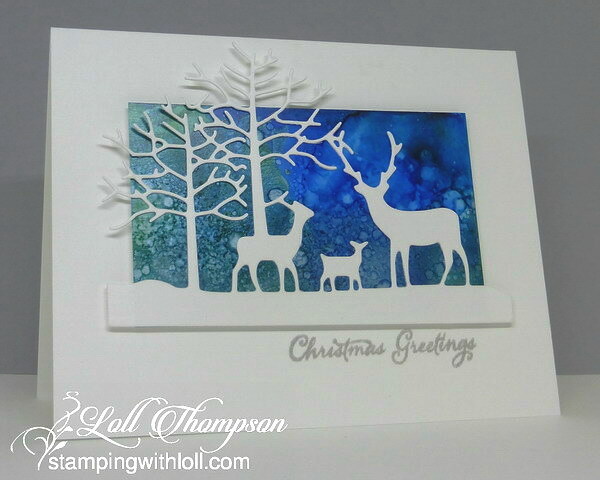 Your background is just stunning and the white die cuts make the perfect winter scene! Loll not only is your background stunning but the way you used the diecut is simply fabulous . Thank you so much for sharing your experience with the Aliexpress dies...I was so temtpted to get some of the designs but was unsure if they would cut properly!! Beautiful winter scene, Loll! Your background is so striking...I love how it gives the effect of a cold winter night in the woods! Such a lovely silver sentiment, too...it's perfect! Gorgeous scene and a really lovely design.